The quest for the 13 artifacts in the Top Cow Universe continues. 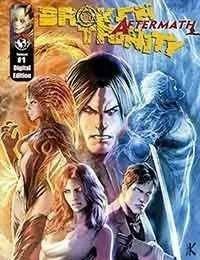 Following the events of Broken Trinity come two new characters, two new stories and another chapter in the growing Witchblade saga. Michael Finnegan wrestles with the power and purpose that comes with the Glacier Stone, and his first test might be saving Darkness wielder Jackie Estacado from himself. Hundreds of miles away, Glorianna Silver suffers from her banishment at the hands of The Angelus, and in order to survive, she will have to embrace the power of the Ember Stone and the destiny it has for her.